The coming week, heading into various religious festivals, also brings the first significant Bradley Model turn date for 2015. Jupiter, head honcho of the Old Gods, will also be strongly influential in the next few weeks, as it goes Direct and receives a trine from the Sun. Strong Jupiter periods tend to exaggerate either optimism or fear, so we can expect some explosive moves ... one way or the other. 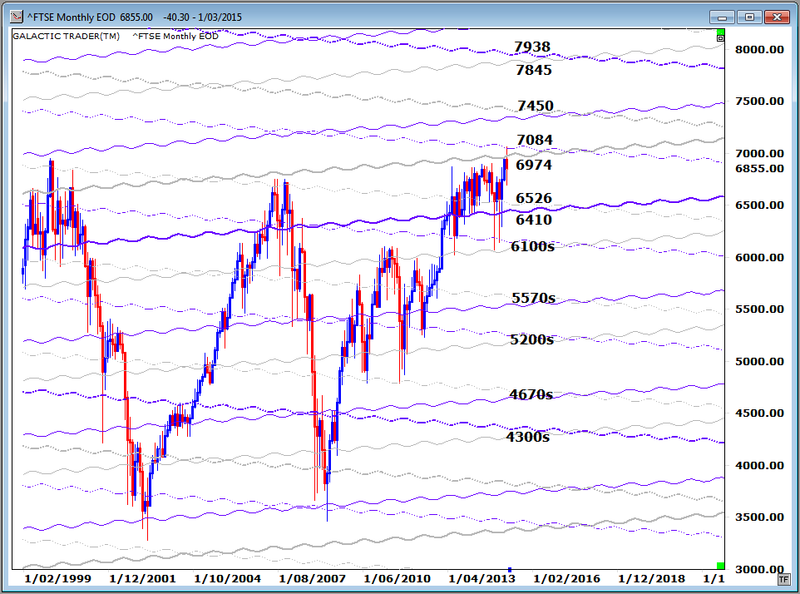 The period finds Wall Street's SP500 index beginning to bump its highs against some major planetary resistance and it's that we'll spend a little time looking at in this edition. There are also updates on the ASX 200, Germany's DAX and London's FTSE. The Full Moon next weekend will be a lunar eclipse ... sister of the recent solar eclipse ... and the configuration will again trigger the broad implications of the long-running Uranus-Pluto square we've talked about many times in the past few years. Uranus and Pluto have now completed exactitude of the square for the last time, but the "orb" of the aspect will continue to linger. About once a year, depending on the speed of rallies or downturns, the SP500 comes into contact with primary price lines from the inner planets ... the Sun, Mercury, Venus and Mars. 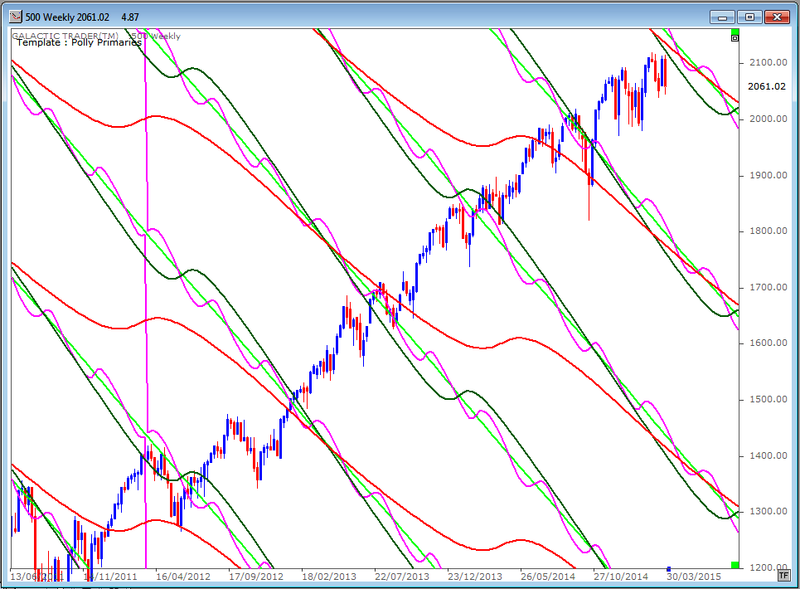 In our first chart, we'll look at how these tend to impact rally phases in the index. 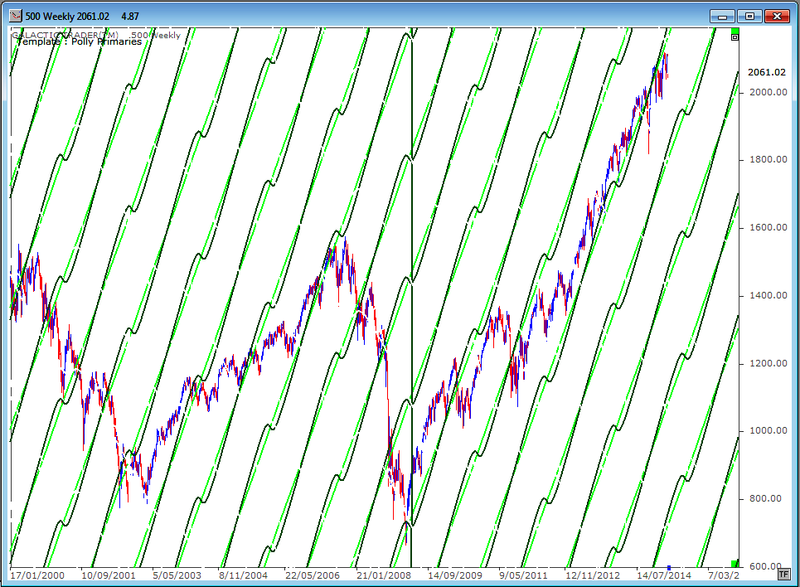 It's a weekly price chart showing only the Sun and Venus primary lines. Price tends to rise at an angle closely aligned to the annual movement of the planets. Sometimes price stalls and goes sideways, until it picks up a boost from contact with the next set of rising price lines. 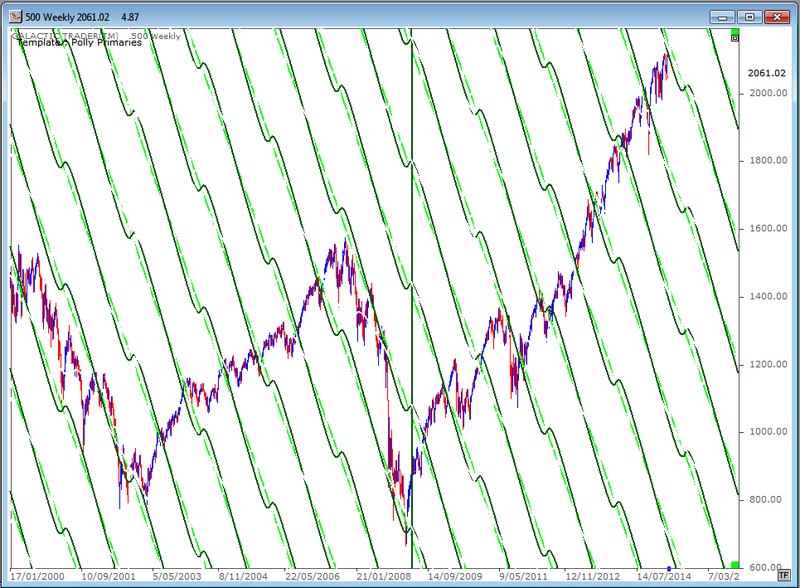 But, what goes up must come down, at least to some degree, and our next chart shows the Sun-Venus impact on the timing and speed of major downturns and significant Bear plunges. Well, the impact can be dramatic. 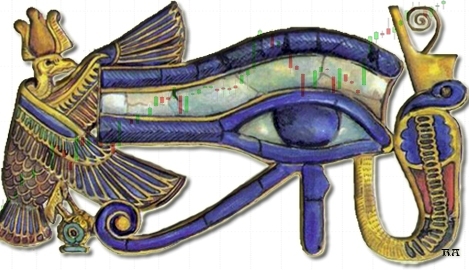 In our third chart, I have included Mercury and Mars into the mix and we will take a close-up view to show the sort of danger the 500 now faces if it cannot burst above the resistance of the planetary downtrend lines. What it suggests is that Wall Street is now very close to hitting a major hurdle ... a set of planetary influences which almost always produce a multi-week correction. Our next chart shows the more horizontal price lines of the outer planets and provides the major probable targets for rallies and declines. Regular readers will have become quite familiar with these and know they provide excellent Entry and Exit levels for trades ... if the oscillators on shorter-term charts are showing distinct potential for a trend turn. Of the other major Western stock indices, Germany is the strongest. And just maybe too strong. Its northbound breakout in the past few months catapulted it above what should have been, based on historical behaviour, a strong resistance barrier. And our Big Bird oscillator isn't really overjoyed by the move. While the DAX has left its two previous Bull peaks way behind, the British market continues to struggle against the long-range planetary price lines which acted as a slaughter house for the earlier Bulls. Allow a little leeway for the posted prices because they're "wavy" and exactitude depends entirely on timing for the monthly bars. 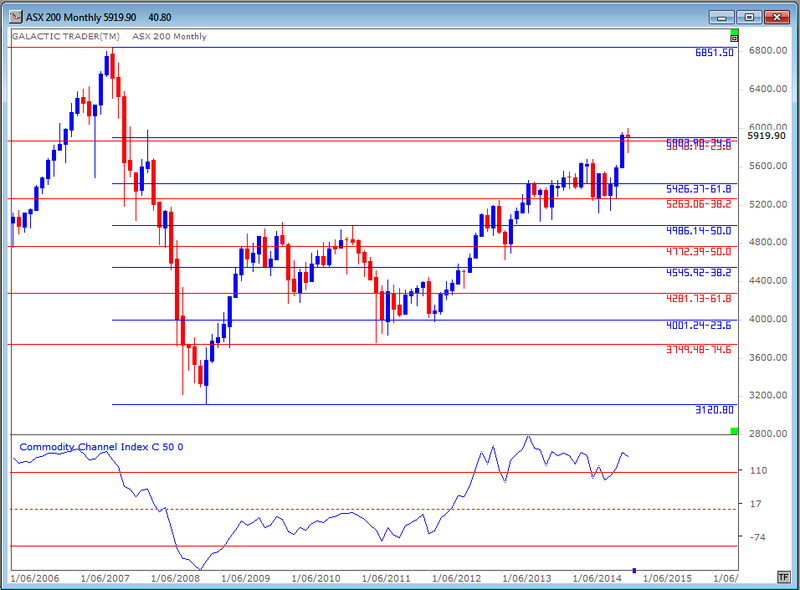 Australia is also faltering at a hurdle ... in the ASX 200's case, a double Fibonacci Retracement barrier. 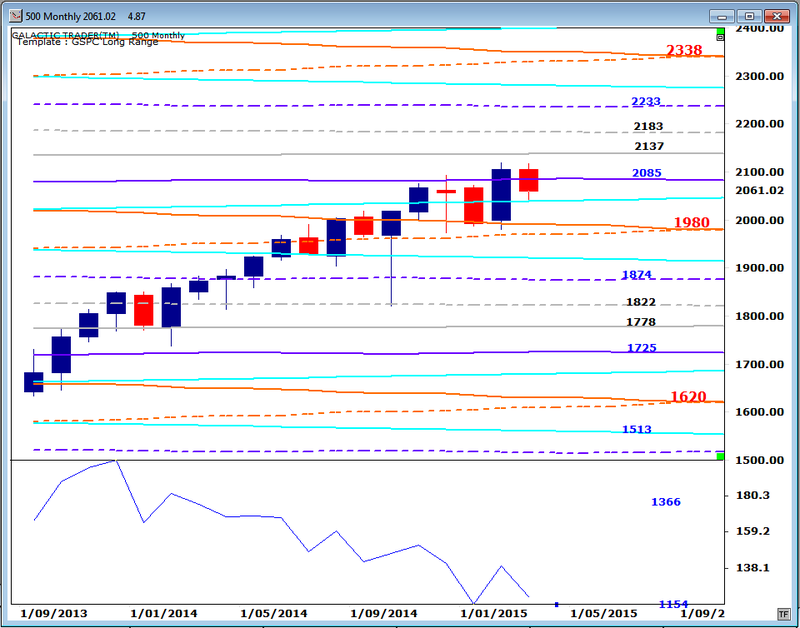 The index managed to break free of the doldrums in the past few months and put on a spurt. 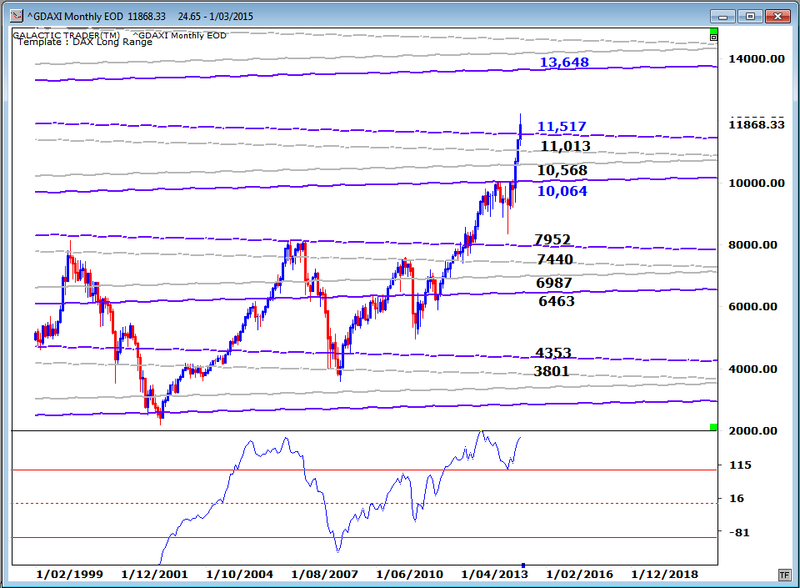 There is some disagreement about exactly where the current blue Fibo Rx level lies because of data differences at the 2009 low ... but all levels of the blue lines displayed below have been important during the past few years and the data difference is not really major. You'll note that on the chart above, the Big Bird oscillator is starting to sing off-key and that it is a double Fibonacci barrier. 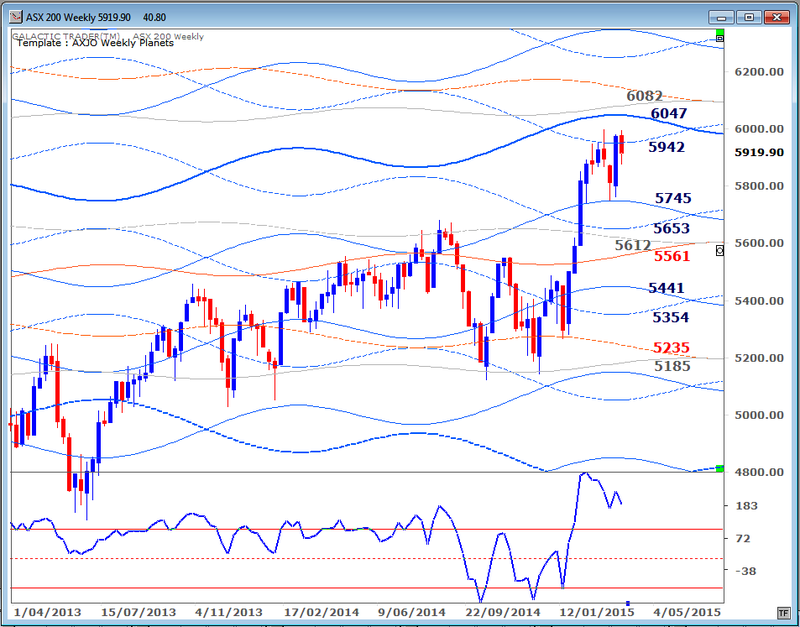 Turning our attention to the ASX 200's Weekly Planets chart, we can note a primary Saturn barrier not far ahead at around 6050, with a Neptune level at 6082. Weekly Big Bird is even more distinctly off-key than his monthly version as price battles to overcome the minor Saturn resistance around 5942. And, yes, I've been terribly slack this year ... first time in years I've been able to enjoy the southern Summer and, literally, take some time out to smell the roses. And they smell so much better than Pollyanna! I will try to include the Indian/Asian indices in the next few weeks. In the meantime, just keep a weather eye on the near-term charts, especially with the Bradley date approaching (all of which was covered in the Forecast in January) and as Pollyanna bumps her silly noggin against the inner planet downtrend lines.